Mitch Libby Trackless Trolley Photo Collection. 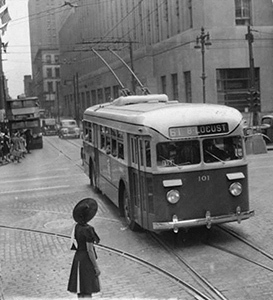 Philadelphia's second trackless trolley route began operation 1941.
to Center City at 8th & Locust (later 8th & Walnut). northbound on 9th Street crossing Market Street in Center City. The map at left shows the pre-2003 trackless trolley system in green. Dashed green lines show previously abandoned trackless routes. To place the trackless routes in context, the Market-Frankford El and Broad Street Subway lines are shown in black. Click on the map for an enlarged view. Trackless trolleys combine the best features of trolleys, that is, their minimal levels of noise and air pollution, with the flexibility of a bus; that is, they can steer around obstructions in the street. One only has to stand at a street corner as a trackless trolley pulls away from a stop to appreciate the total lack of diesel fumes and engine roar, compared to a diesel bus. As cities realize the importance of maintaining the Quality of Life in their neighborhoods, the benefits of trackless trolley service should be obvious. As late as 1981, SEPTA kept two fleets of ancient trackless trolleys in service. Brill tracklesses built in 1947 equipped the Routes 29 and 79 in South Philadelphia. Marmon-Herrington tracklesses built in 1949 and 1955 operated on the Routes 59, 66, and 75 in North and Northeast Philadelphia. Most of the photos on this page show the Brills and Marmons in their last years. In 1981, a fleet of 110 new AM General trolleybuses were purchased to replace the Brills and Marmons. At first, the new electrics were so trouble-prone that the manufacturer was forced to recall the entire fleet. More than one driver of an AMG had been jolted by 600 volts when putting the pole up to the wire. Once the problems with the AMGs were ironed out (and AM General dropped out of the trolleybus-building business), the old green Marmons and Brills were finally retired in the summer of 1981. 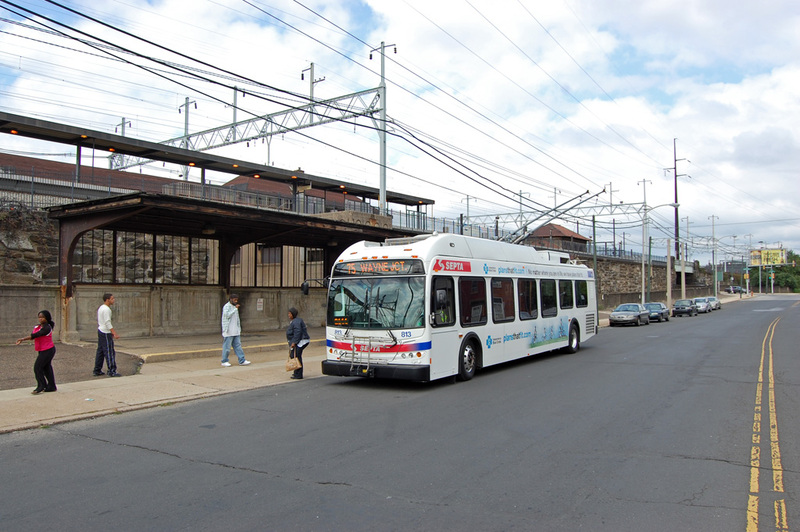 In June 2003, the SEPTA board voted to suspend all trackless trolley service "for one year." With the AM General trackless trolleys in need of replacement, new ETBs were procured. Anti-electric pro-diesel bus factions in SEPTA management used that opportunity to further dismantle the electric transit infrastructure inherited from PTC. 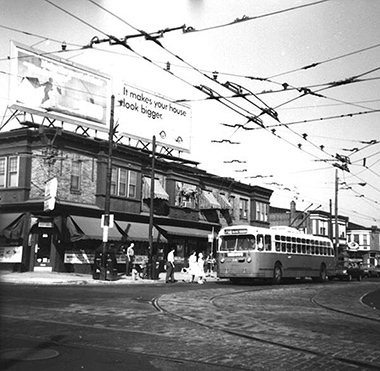 Only enough trolleybuses were ordered to serve the three Northeast Philadelphia electric routes. 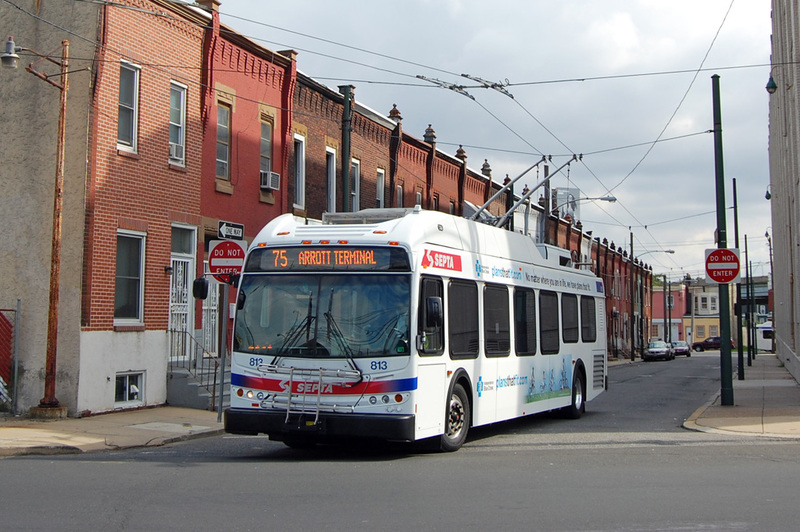 The south Philadelphia routes would be served by diesel buses -- this despite opposition from half a dozen South Philadelphia neighborhood groups, the Clean Air Council, and others. SEPTA proved, once again, that it is an agency accountable to no one. June 2007 -- The pilot New Flyer trackless trolley, no. 800, arrived in Philadelphia for testing. Thirty-seven more would follow, and currently provide service on Routes 59, 66 and 79. 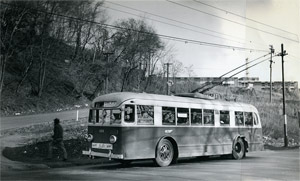 Forty-three 300-series Marmon-Herrington trackless trolleys were purchased by PTC when the Route 66 was converted from a streetcar line in 1955. The Route 66 starts at the northern terminus of the Market-Frankford El, and runs 6 miles to the city line at Knights Road in Torresdale. An extra set of wires on this route allows for express service during rush hours. Of the 1624 trolleybuses built for 16 American cities by Marmon Herrington in Indianapolis, Indiana, 71 were built for Philadelphia. 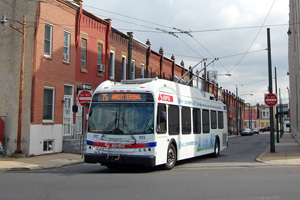 Route 75 runs from the Margaret-Orthodox station of the Frankford El, west along Wyoming Avenue, connecting to the Broad Street Subway in Logan, and on to lower Germantown where connections could be made to the Routes 23 and 53 trolleys. Here Marmon 343 runs two blocks along the southbound "outer drive" of the Roosevelt Boulevard in Logan. The Route 75 was rerouted through Logan when this line was converted from streetcars in 1948. Across all twelve lanes of Roosevelt Boulevard from the photo above, Marmon 497 turns from the Boulevard to resume its eastbound run on Wyoming Avenue. The twenty-eight 400-series Marmons were built in 1949, and were one window shorter than the 300-series Marmons constructed in 1955. When SEPTA took over the PTC in 1968, the PTC wing emblem on thousands of transit vehicles disappeared almost overnight. A plain rectangle lettered "SEPTA" was slapped over each Wing. But Marmon-Herrington trackless trolley 318 kept its PTC Wing at least until summer 1977, when this photo was taken at Frankford Depot. The Wing seems to have survived beneath an advertising panel, only briefly revealed each time the advertising card was changed. By 1977, the bracket meant to hold the advertising cards had been removed. Winter road salt has coated the two-tone green and white paint on this 1955 Marmon, seen here westbound on Wyoming Avenue at 9th Street. Nine hundred and fifty-seven rowhouses on seventeen square blocks in the Logan section of Philadelphia have since been demolished, as their settling foundations caused collapses and gas leaks. A corrupt city administration eighty years ago set up this disaster, by ordering all coal ash in the city to be hauled to this site. The land happened to be owned by real estate developer friends of the then-mayor. The marshy flood plain along Wingohocking Creek was filled with as much as 40 feet of ash, and the townhouses built on this unstable fill began settling almost as soon as they were completed. Here is the exact same location, 22 years later. Trackless trolleys continue to serve on this route, although ridership has declined in recent years. In these photos, AM General trackless 826 heads westbound on Route 75. El and terminal reconstruction at the eastern end of this line forced the substition of diesel buses for several years. Frankford Depot streetcar barn was torn down and replaced with a bus garage by the new National City Lines (General Motors) management in 1955. 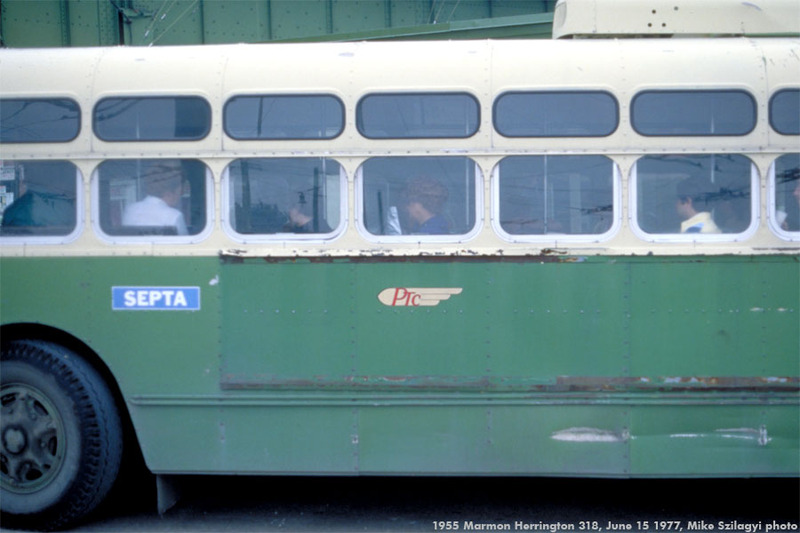 In 1980 Marmon-Herrington trackless trolleys still provided service on the three trolleybus routes that radiated from Frankford. Sixty-five Brill model TC-44 trackless trolleys were purchased in 1947 by PTC for service on Routes 59 and 75 in Northeast Philadelphia. Relatively short coaches, only 36 feet in length, in later years the last of the Brills were assigned to routes 29 and 79 in South Philadelphia, where they remained in service until 1980. Before ordering new trackless trolleys, SEPTA experimented with rebuilding the existing fleet. 1955 Marmon-Herrington no. 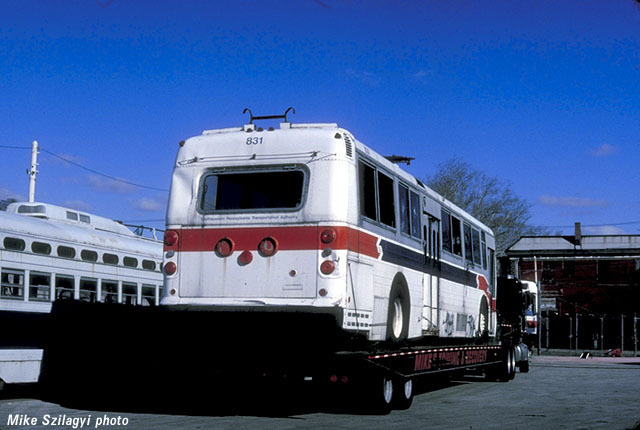 325 was rebuilt with state of the art chopper control, and body modifications which included dual headlights from a GMC "fishbowl" diesel bus, and application of the white-with-red-and-blue-band SEPTA paint scheme that would soon be applied to all SEPTA vehicles. This photo shows the 325 in the yard at Frankford Depot, alongside the first new trackless, AMG 800. The AM General trackless trolleys were the first new tracklesses in twenty-five years in Philadelphia. Here brand new 800 poses on the newly rebuilt Wyoming Avenue bridge in Juniata Park, on a charter excursion. Despite their modern looks, these new coaches had been poorly designed. They would prove to be such lemons that the manufacturer opened a plant in Philadelphia were repairs could be made. They were the last trolleybuses built by AMG. Trackless trolley service on Routes 59 and 66 stretches into far Northeast Philadelphia. At the turn of the 21st century, many neighborhoods in the "far northeast" had not seen the demographic shifts that have occurred in other neighborhoods: crime rates tend to be lower and urban blight contained to small pockets. This photo was taken in the spring of 2000 on a beautiful stretch of Castor Avenue in the lower northeast, just a couple blocks west of Frankford. AMG trackless 857 southbound on Castor Avenue in April 2000, photo by Mike Szilagyi. This is one of two AMG coaches retrofitted with a ThermoKing air conditioner. 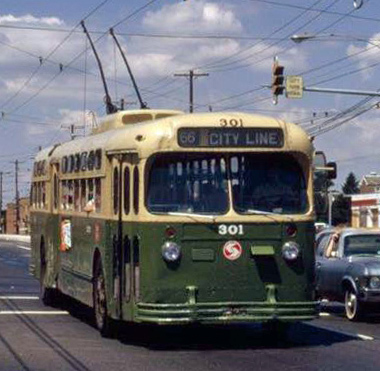 Until 2003, trackless trolleys served Routes 29 and 79 in South Philadelphia, on Tasker and Morris Streets, and Snyder Avenue respectively. At the location in this photo, overhead wires for the Route 79 trackless intersect with those of the Route 23 trolley on 12th Street. Also visible in the photo is the trolley track used by Route 23 streetcars turning back at Snyder Avenue. Streetcars have not operated on the Route 23 since 1992 (save for occasional charters and seasonal special service). 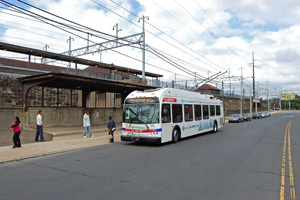 In the early 1990s, SEPTA briefly considered converting at least the southern portion of Route 23 trolley (by then a diesel bus line) to trackless trolleys. This would have connected the separate South Philly and Northeast Philly portions of the trackless system. Anti-electric pro-diesel factions in SEPTA management won the argument, so the South Philly trackless trolley lines were abandoned instead. Declining ridership on the trackless routes led to the storage of half this relatively new fleet of coaches. Many were stored on SEPTA property at Midvale, and during the 1990s a few even found their way out to the suburban depot on Ridge Pike in Plymouth Township. Some of the unused coaches had been considered for sale to Dayton Ohio's system, but were deemed unsuitable due to their poor condition after having been stored outdoors. The original number 800 sits just visible, behind the coaches in the photo at left, minus its doors. Some AMG trackless trolleys were stored at Luzerne Depot before being sold for scrap. Luzerne, once slated for demolition, is now home to a recycling company. Follow this link to more photos of the 2008 New Flyer trackless trolleys.